Not everything in Java is an object. There is a special group of data types (also known as primitive types) that will be used quite often in your programming. For performance reasons, the designers of the Java language decided to include these primitive types. Creating an object using new isn’t very efficient because new will place objects on the heap. This approach would be very costly for small and simple variables. Instead of create variables using new, Java can use primitive types to create automatic variables that are not references. The variables hold the value, and it’s place on the stack so its much more efficient. Java determines the size of each primitive type. These sizes do not change from one machine architecture to another (as do in most other languages). This is one of the key features of the language that makes Java so portable. 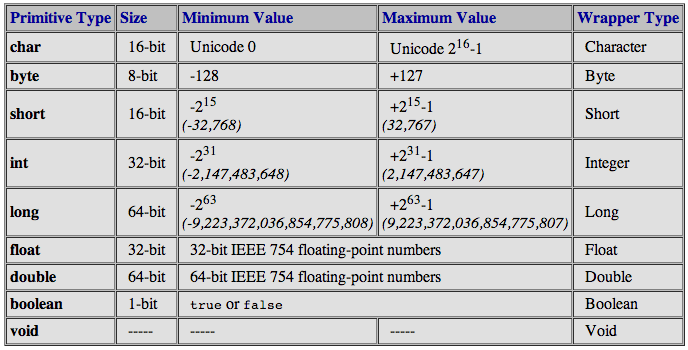 Take note that all numeric types are signed. (No unsigned types). The first Println will print true whereas the second one will print false. The problem is when comparing two wrapper class objects we cant use == operator. It will compare the reference of object and not its actual value. To convert simple data types into objects, that is, to give object form to a data type;To convert strings into data types (known as parsing operations).This is what you want to explain.If you explain the difference between primitive data type and data in object form in terms of a java program for use in List,Map etc., that will be much better explaination.Because people who have learned programming using C++ or C, for them wrapper class is not of much use.In C or C++ just use atoi for converting string to integer without going through un-necessary wrapper class. There are many great things in Java and more than that there are un-necesary things which could be simplified.The best thing you said is “avoid wrapper class”. Found your site today and already I am liking it. I am new to Java programming due to a critical need to a program at work and a very short time to make it happen. I have a question about ‘date’ – in all my help-seeking I find creating ‘date = new Date();’ and not using a primitive. Might this apply for a date as well as examples above? The date variable is later outputted using ‘SimpleDateFormat’ function. Sorry for late reply. Java provides the Date class available in java.util package, this class encapsulates the current date and time. As you already mentioned, below generates new Date. I believe, Date doesn’t fit into primitive type. There are so many online Basic Java examples also available which may help you.